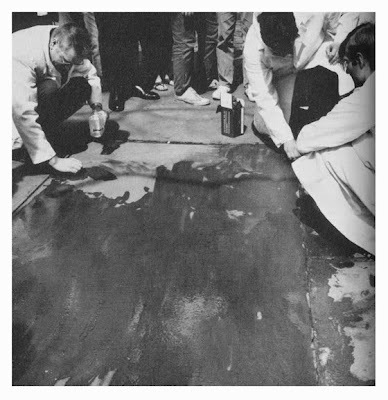 An obscure 1960s art movement called Fluxus and groundbreaking, activist artists like Yoko Ono laid fertile groundwork for 350.org's International Day of Climate Action on October 24. Yoko Ono's and John Lennon's anti-war Bed Peace performance art action laid the creative groundwork for Bill Mckibben's and 350.org's magnificent International Day of Climate Action which just happened on October 24th. 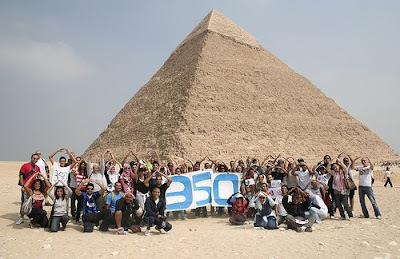 350's amazing worldwide action included over 5,200 events in 181 different countries. Both events utilized simple, hand-written placards in an attempt to provoke change with unified, social action. One against war. The other against our own war against the planet. Last week's environmental action included an event in Hungary where hundreds of bathers jumped into the public baths in Budapest to participate in a 350 synchronized swimming performance. In Nepal, a thousand young people and monks marched to the Swayambhunath world heritage site temple where they formed a large 350with traditional lanterns. Cambodian citizens from across their country gathered at the famous Angkor Wat to take a giant 350 action photo. 350 Americans danced to Michael Jackson's "Thriller" in Seattle because, as Bill McKibben warned, "if we don't stop global warming, we might as well be undead." 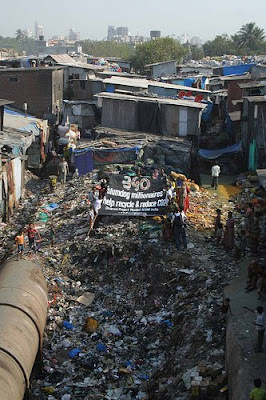 McKibben noted prior to the event this past weekend that "350 is the most important number in the world. Scientists have told us that 350 (parts per million) is the most carbon dioxide we can have in the atmosphere. We're making sure everyone knows." Though decades apart, the events of the 1960s and 2009 are kindred spirits. 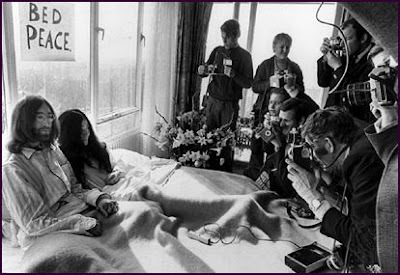 By hanging the simple sign "Bed Peace" above their bed, John and Yoko's notoriety allowed them to make this event widely known in a pre-Internet world. Mass media coverage quickly spread the message to a global audience. The couple took the ordinary moment of sitting in bed and made it a daring statement. They called out for action less we just sleep and let unordinary things like war become ordinary and acceptable. Fueled by the power and reach of the Internet, 350 and McKibben do the same. 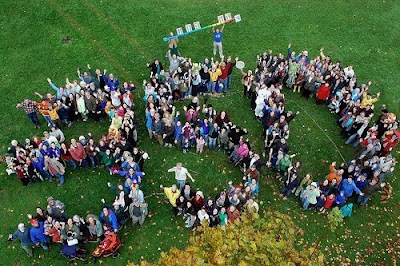 350 takes the ordinary moments of people coming together to take a picture and makes a unified statement of concern for our shared global condition. Photograph of Fluxus group performing their Street Cleaning Event taken June, 1966 at Grand Army Plaza (58th Street and 5th Avenue), New York City. Photograph by George Maciunas, 1966. Many of the artists working in and around the Fluxus movement were not so clearly political as John and Yoko. Yet, they oftentimes joined together with artists around the world to do the same thing at the exact same time. For instance, musicians in different cities around the world would converge at the exact same time and play the same music on a cello on a street corner. This spoke to joining creative forces around the world in common action. So, here's to Bill and John and Yoko. And, kudos to the other artists in the 1960s that used their art to make world wide connections, artists such as Naim June Paik, George Marciunas and John Cage. Congratulations and thank you to the many thousands of people around the world who joined this month to bring attention to the importance of the number 350. The message is clear that the world needs to listen to itself and join together to effect important change. 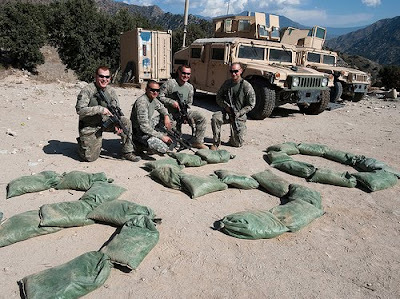 Picture American Troops in Afghanistan making environmental statement, October 24th, 2009. Thank you Yoko, John and Bill. Let us all Give Peace a chance. And, give the world a chance to heal from self inflicted wounds. There's no doubt in my mind, that by working together, the world's many diverse cultures and countries can solve any problem that comes before us.